I started the season believing it unlikely any seeds I’d saved the prior year had any viability, sheerly from an inclination to doubt my ability. 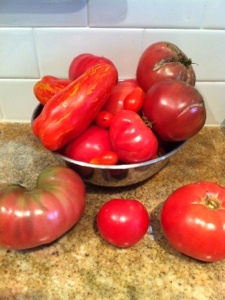 I was also skeptical that any of the new breed I’d planted (donations from friends who already had their hands full – all heirloom and some varieties from seeds I’d given them) would ever thrive. Now I start and end each day surveying the tomato farm, and learning something new from each tomato I harvest, whether it’s red (or striped or nearly purple), ripe and juicy, or mealy and overripe and spotted with little critters lunching, or perfect on the outside but with evidence of vine borers once cut open, or growing around the Christmas ribbon I’ve used to tie up the stalks that got much taller than I ever expected. Every day, there’s at least a couple tomatoes worth picking, a few that have fallen or been victim to a random local cat (or my dog), and some just hanging out on the ground. Every day, there are twice as many lessons as there are tomatoes to pick. My surprise that there was any harvest at all. Setting aside my natural gardener’s tendency to fear that everything I touch will die (anecdotally I’ve confirmed we share this in common, and no wonder since technically it’s true, though most things will hopefully grow, thrive, and produce progeny before they kick off), I’ve learned as much studying those ones that didn’t make it, as the ones that did. Now, I wonder what I can do when I start getting some confidence with this stuff — maybe scale back my backyard tomato farm to a manageable garden plot and trust what I put there just might actually grow.